In the beautiful highlands of Scotland north of Inverness lies the only organic Brewery in Scotland, Black Isle. The Scottish brewery is also just 20 minutes from Castle Stuart Golf Links. With their slogan ‘save the planet, drink organic’, the brewery is very proud that everything used in their brewing process is organic. As a result this is what gives their beer its distinct fresh and natural taste. The water is drawn from their own private source. In addition the malting barely used comes from their very own 125 acre organic farm. The spent grain is then fed to their flock of Hebridean sheep in one sustainable cycle. 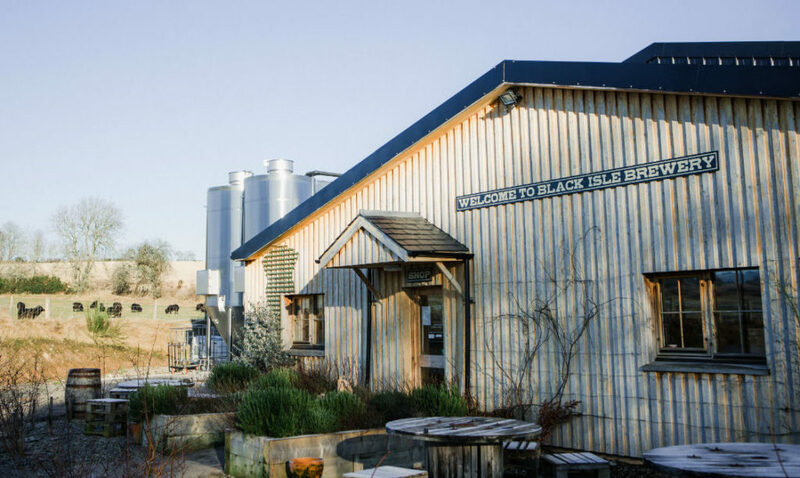 Black Isle first began in 1998 and now produces up to 10,000 litres of beer a day; distributing to locations in Scotland and around the world, including Sweden and Japan. Interesting fact: Home of the brewery at Allangrange translates as ‘a fertile field of corn’ in Gaelic. On this very farm in 1790, Sir Roderick Mackenzie recorded that the land was first cultivated for growing barley because it was of “superior quality for the brewer and distiller”. Started by two young Scottish lads and a dog in 2007 in the small Scottish town of Fraserburgh in the far northeast corner of Aberdeenshire. 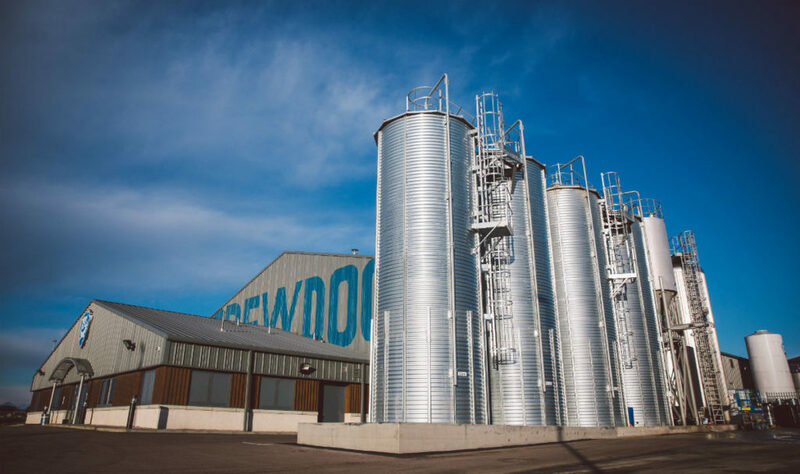 Now, Brewdog has grown to become Scotland’s largest independent brewery; with a state of the art eco Brewery in Ellon, North Aberdeen and 65 bars across the globe! Excitingly, Brewdog also opened another eco brewery across the Atlantic Ocean. Located in Columbus Ohio with the world’s first craft beer themed hotel, ‘The DogHouse’, right nextdoor. Not a bad day’s work for the guys!! We would definitely recommend enjoying a Dogwalk Brewery Tour if golfing in the area of Aberdeenshire, Scotland. Interesting fact: The flagship beer for Brewdog and the biggest selling craft beer in the UK is their hoppy, tropical flavoured ‘Punk IPA’ which in their own words “began a revolution”. Less than 5 miles from The Old Course in St Andrews, Eden Mill is a must visit for any beer lover staying in the area. The story begins a very long time ago in 1810, when the famous Haig family ran Seggie distillery until 1860. It was then later reopened as a paper mill in 1872. It continued to operate as a paper mill until 2008. In 2012 Fife businessman Paul Miller, resurrected the site and opened Eden Mill. It is in fact Scotland’s first and original single site combined brewery and distillery. 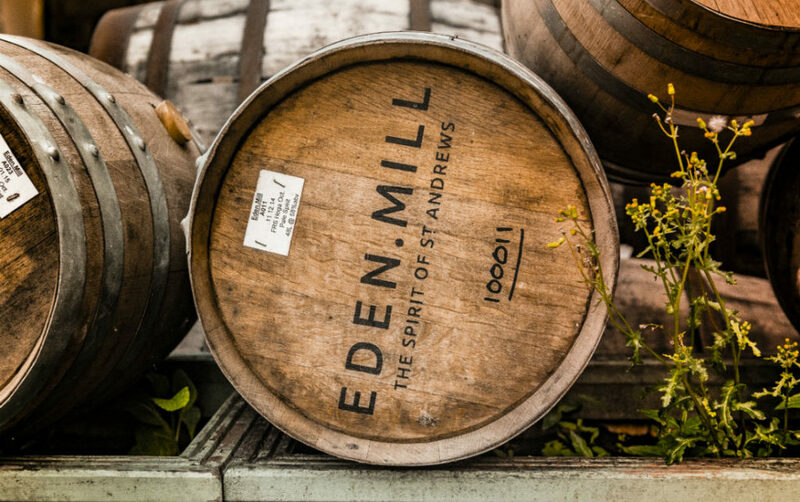 Along with beer Eden Mill also produce whisky and gin – something for everyone! What better way to start a brewery tour than with a refreshing craft beer before learning about the history of the site in Scotland, the brewing techniques and the key ingredients used. Interesting fact: Their 19th Brew beer is available to golfers on the 9th hole of The Old Course, St Andrews. The refreshing, light, citrusy ale is the perfect pick me up for the next 9 holes! 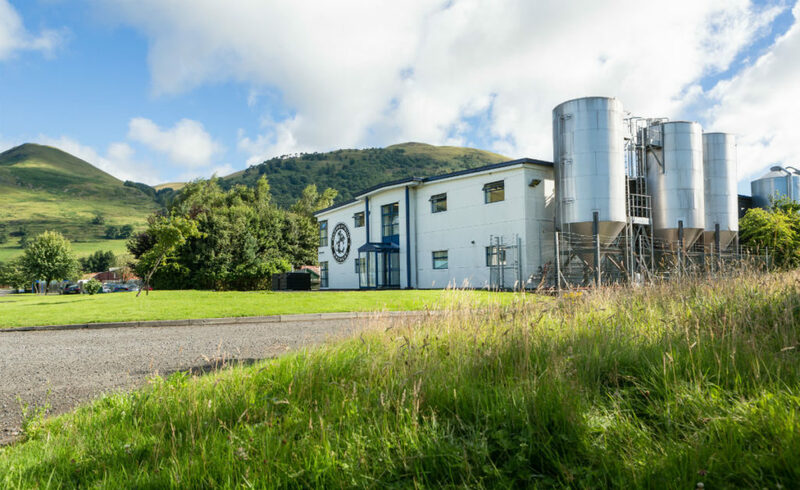 Harviestoun Brewery is located at the foot of the stunning Ochil Hills, in the small town of Alva. Also within 20 miles of Gleneagles, a visit to this Scottish brewery is ideal when playing golf in the Perthshire area. From the founder, Ken Brooker, brewing in his back garden shed in 1983, Harviestoun has grown to become one of Scotland’s top breweries. Extremely innovative, they have also been well respected on the US craft scene since 1999. One of Harviestoun’s signature beers is the award winning ‘Champagne of Lagers’, ‘Schiehallion’, which was first created in 1994. The name comes from one of the best known Munros (mountain over 3,00 feet in height) in Scotland located in Perth and Kinross. One of their other famous beers, is Old Engine Oil Ola Dubh which is aged in whisky barrels. Interesting fact: In the early days at the farmhouse brewery a number of mice would steal the barley. However one in particular caught their attention. Now the brewery’s mascot, Harvie the mouse can be found on the labels adopting a different character for each beer! The original purpose for the beer was to simply flavour barrels used by William Grant Distillers for their ale cask reserve whisky and then be discarded. However, founder Dougal Gunn Sharp decided rather than throwing away the used beer, they should age the beer in the barrel. As a result his creation was born! Now one of the world’s first international craft beer brands, their lager is the No.1 craft lager in Scotland! Brewing in Wellpark Brewery in Glasgow since 2003, Innis and Gunn have now taken over the Inveralmond Brewery in Perthshire. The site brew both Inverlamond and Innis & Gunn beers. Along with their best sellers, ‘Ossian’ and ‘Lia Fail’, Inveralmond are also known for the original and authentic Czech pilsner brewed in Scotland, ‘Sunburst’ with yeast sourced from Brevnosky Pivovar, one of the oldest breweries in Prague. 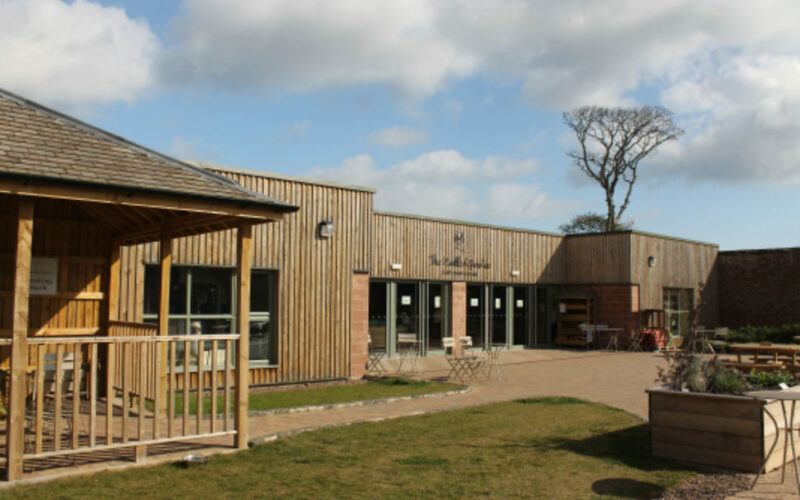 Located within Archerfield Estate and next door to the infamous Muirfield, a visit to the Knops Beer Company is a must if golfing in East Lothian! 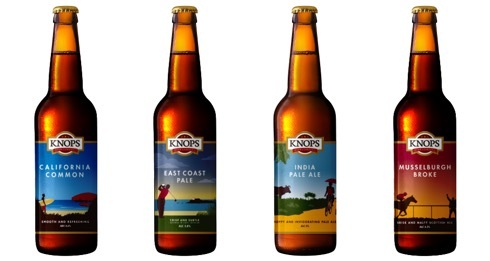 Only established in 2010, Knops Beer Company is a modern Scottish brewery; refining traditional and long forgotten methods along with creating new experimental styles. They are modern in the sense that their brewing is based on science, equipment and skill. They understand the ingredients, how to combine them and, more importantly, how to consistently brew beer that always tastes great. The whole process, from brewing to bottling, is carried out on site by Robert Knops and his small but dedicated team. Above all, they brew beers that you’ll love to drink! Interesting fact: In 2013, the brewery released a special edition pale ale ‘East Coast Pale’ to celebrate The Open taking place at Muirfield. However due to the popularity the beer became a permanent addition to their beer range. If you wish to include a visit to any of the Scottish breweries listed above during your tour to Scotland please specify on our enquiry form. Alternatively please let us know if you would like to arrange a beer tasting or visit any other breweries.